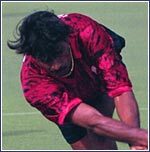 Dhanraj Pillay may not possess the magical skills of the legendary Dhyan Chand, a Balbir Singh or Mohammad Shahid but he has already achieved enough to be ranked alongside them in the annals of Indian hockey greats. It is eleven years since he made his international debut in the 1989 Asia Cup in Delhi, and he has won almost every accolade the game has to offer. An Asian Games gold medal as captain, the Arjuna award and now the Rajiv Gandhi Khel Ratna are among his prized achievements, not forgetting being nominated for the international player of the award these last two years. The only glory that has eluded him is an Olympic gold, though he has been to the quadrennial Games twice -- in 1992 (Barcelona) and 1996 (Atlanta). That he hopes to add it to his collection at the coming Sydney Games which is expected to be his swan song. "That has always been my wish, and only goal left. I hope to realise it this time," he confesses, adding: "Something tells me this team can win the gold." Indeed, if India is to win the gold medal it last won at the Moscow Games in 1980, much will depend on the 32-year-old Cancerian, with over 320 caps, who is rated as one of the most feared forwards in contemporary hockey. The quicksilver centre-forward is back in the team after being 'rested' for 11 months by the Indian Hockey Federation following the Asian Games triumph, and in his prime. Proof of his prowess came in the recent four-nation tournament in Perth, which India won. Sports Editor Ivan Crasto caught up with the brave heart of Indian hockey. Congratulations on winning the Rajiv Gandhi Khel Ratna. Thanks. I am very happy. I never expected it. First it was the Asian Games gold; then came the nomination for the FIH international player of the year award, then the contract with Stuttgart Kickers in Germany and now the Khel Ratna. It seems all good things are coming your way. Yes, you are right. All good things are coming my way. The first good thing was the signing with the German club, then the four-nation tournament and now the Rajiv Gandhi award. The team is also shaping very well; we played the four-nation tournament in Australia and beat teams like Australia and Germany. It is a good sign. Beating Australia on their home ground is a big achievement. Winning the Khel Ratna, I think, is confirmation that Dhanraj Pillay is the best, something many, including the IHF, had doubted previously. You can say yes. I think the Government of India has given me recognition -- that Dhanraj is the best. But now I must forget about it. I must prove also. I have to prove myself at the Olympics. So you are anxiously looking forward to the Olympics. Exactly. Winning the Olympic gold is my goal. Do you think India can come back with the gold? India has the potential; India has the players. They can think in that direction. After the four-nation tournament the players's attitude has changed. They are very, very motivated. Even the young boys feel they are capable of winning. For you, this will be your third Olympics. I also think this will be my last Olympics. So I have to go all out and prove that I am the best. What makes you so confident? Is it because this team has been together for quite some time? These players have been together for more than a year. One or two changes are there, but most of the players are the same. So they are bound to fare well. Dilip Tirkey, Lazarus Barla, goalkeepers Jude Menezes and Edward Aloysious are there. In the half line there is Saini, S S Gill, Ramandeep Singh and Mohammad Riaz. They all combine well. Which means changes should not be made too often; there should be continuity. Certainly. Changing the players and coach everytime upsets the rhythm of the team. Since last year we have had the same coach, same players, so it makes a big difference; players feel stable. Initially, when you got back into the team, you had some problems adjusting with the forwards, especially the newer, younger lot. Has that been rectified? Everything is going fine now. The juniors and seniors are combining well. Mukesh is back in the team, Dhillon is there. Then there is Sameer Dad, Gagan Ajit, Deepak Thakur and Senthil. The problem was because I was not matching, or keeping pace with some of the boys; or they were not able to keep pace with me. It was because of speed or something like that. When I would ask for a pass they would fumble, but now it is working well. Maybe, the junior boys were scared or nervous because I am the seniormost player in the team. Do you think these boys can match the European teams at the Olympics? I think, yes. We already know which teams we will be playing against; who we are playing first. I think we will all give, and are capable of giving a hundred per cent. We have not seen much of Argentina or played with them during the last two, three years. But we will be watching videos of them. We all know what happened at Atlanta. I think we played very badly in the first match. We lost to Argentina by one goal and because of that could not qualify for the semi-finals. Why is it that our team plays so well, but cannot finish? What is it that we lack? I think in that particular match against Argentina we missed chances like anything. We had the upperhand in the first 25 minutes. You can put much of the blame on me. In those 25 minutes I had about four clear chances, but missed. The ball would just not go into the goal. Mukesh and all the other forwards tried hard and forced many penalty-corners but we missed that too. After that they got the lead and were defending. All nine players were in the 'D' and we could not score. Is it because of too much dribbling that we do? Have you changed that style? Now we have changed completely. There is less holding onto the ball, but we use our skills when needed. Now we play after studying the opposing team, because we cannot always play skillful hockey. Hockey has changed like anything in the last two years. It has become very fast, so you have to have very fast forwards and we have to concentrate on penalty-corners. How is the conversion of penalty-corners coming along? It has improved during the last year. In Australia (the four-nation tournament) it was very good. The strike rate was 67 per cent, which is excellent. Dilip Tirkey is hitting well. Jude's (Menezes) confidence is building up every day. He played very well in Australia in the four-nation tournament. In the first leg at Sydney, he was a bit nervous. But the coach persisted with him in the second leg at Perth and he was fantastic. You see the young boys get confidence. You can't expect a player to play well on his first trip in international hockey, against the strong European teams or Koreans. Now they know they have nothing to worry if they make mistakes or have a bad game. I am not saying their places are ensured in the Olympic team -- you can't say who will make the final 16 -- but most of them know they won't be simply dropped. It helps them to think positive. Is the team employing new tactics or strategy for the Games? We have two or three formations. The 5-3-2-1 formation, and we have 4-4-2-1. We have also tried out 3-3-3-1. We plan to use these, depending on which is the opposing team. Does the team regularly watch videos of other teams or previous matches? We have have been doing so this year. I don't know whether we have videos of the Champions Trophy matches. But an IHF official went to the tournament and arranged for some cassettes. Had you not been 'rested' by the IHF after the Asian Games, you may still have been leading the team. I can say that. But it does not matter. They still have to name the captain for the Olympics. Now f the IHF is thinking that way, I also think the same way. It is over; they gave me some rest and now I am back in the team. Forget everything that happened in the past. I am now only concentrating on the Olympics. You have been playing for India for 11 years, and have given your best. Has hockey given you anything in return? Oh yes, I must say hockey has given me everything. Everything means everything -- money, fame, satisfaction. The situation was like that. I had to say something because the press people were there and just looking at what was happening. I was very angry; my boys were sitting and sleeping on the floor at the airport for 5 to 6 hours and nobody was taking care of them. We were running here and there for food and other things. There was no hotel accommodation. That is why I said it at that particular time. And I can say what I said was right. Have things improved after that? Yes. You see for yourself. So you are happy with what the game has given you? I am very satisfied. 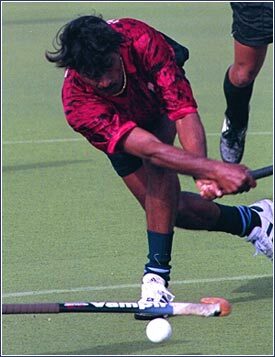 I never dreamt I would win the Arjuna Award or Rajiv Gandhi Khel Ratna when I started playing. When you start playing, you think 'I must play for the state or some big club'. I was very lucky when I started playing. I played for Bombay. It was because of Joaquim Carvalho (the former Olympian). He coached me, and helped me a lot. Whatever I am today is because of Joaquim and, of course, my family. Since you began your career in 1988, you have been with Mahindra and Mahindra. Have they supported you well enough? Mahindras have given me tremendous support. After the Asian Games triumph they gave me an Armada, 1995 model. It was second hand, but I am happy with it. They still give me everything. I have had lots of offers from other companies and clubs to play, but I am very happy with Mahindras. I started playing for them and that is why I don't want to leave them, even though they don't have a team now. Tell me something about your stint with Stuttgart Kickers. It was a very good experience. I was very keen to play in Germany because it was my dream to play in Holland or Germany. I got to play with German players, which was a good experience. I learnt many things because of the way they play. Their style of hockey is power hockey with less dribbling. They blindly listen to whatever the coach tells them; whatever formation the coach wants the boys will play. I also learnt about man to man marking. I learnt how to find alternatives when a player is marking you. How different is it from Indian hockey? Completely different. Very, very professional. Do the clubs watch videos of other teams? Oh yes. On Tuesdays and Thursdays. On Thursdays we watched matches of who we were playing on Saturday. The coach pointed out which players we would have to catch and which defender would come for me. Sometimes I was told to play my own game. All the players, who played for the German national team, were catching me. Because they knew how Dhanraj plays. So it was little bit difficult to dodge them. I was successful. I did not score many goals, but laid the passes for most of the goals my team scored. They were satisfied with my performance. Will Stuttgart call you back? Before I left they asked me to sign for two or three years, but I said I will come only after the Olympics. Maybe, on October 5, I will go back. Then I will sign. There are offers from two other clubs too. Where do the Kickers rank in the German league? Third or fourth. We are level with another team. Very well. The first 15 days I was scared. There was a language problem, but they made me feel at home. Hockey players get respect abroad. I was very happy. I had a car, phone and got an allowance. I only had to play. Don't you think more players should play in foreign leagues, particularly in Europe? They want our players. They want Mukesh. They even asked me to get some of our top players. Let us hope I will be able to take three or four in the new season. Do you see the IHF objecting to many of our players playing abroad? No, the IHF won't object. Gill wants us to play in such leagues. I started with Indian Gymkhana in 1992 in London, then in 1993 I played in France. Tony Fernandes was there. I think he is one of the best coaches. I learnt a lot from him. Playing abroad has helped me a lot. You played under many coaches. Who would you rate as the best among them? More than ten coaches -- M P Ganesh, Jhamanlal Sharma, Balkishen Singh, Zaffar Iqbal, Cedric D'Souza, present coach V Bhaskaran, Pargat Singh, M P Kaushik and... I can't remember. I feel Cedric was the best of all. He had the latest methods and his thinking was advanced. He reads the players's mentality. I think he can be rated the best coach in Asia. 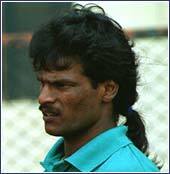 Dhanraj, previously you would always question the umpire's decisions and even throw a tantrum or two on the field. Now it appears you have mellowed. Look, in my 11 years, I have never got a red card. Green I got. Yes, I have now learnt to accept the umpire's decision after playing abroad. Because you can't do anything about it. Remember that Champions Trophy incident at Madras? Yes. What the press wrote about me was wrong. They saw what I did, but what the crowd said they don't know. You can keep quiet about other things. They kept abusing me the whole match, saying things about my mother and sister. That is why I got angry. I say give me bad words, not my mother and sister. I tell you, even now if someone does the same thing I will react in the same way. But I don't want the younger generation to think Dhanraj used to fight with the crowd. Did you model your game on any particular player? 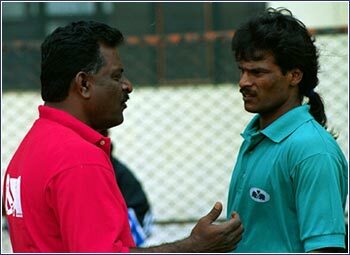 Mohammad Shahid, and Merwyn Fernandes. Shahid is my idol. I still watch video clippings of him. He was one of the best; his style, dribble, everything. After the Olympics, what are your plans? Marriage? No, no. Nothing so far. Haven't thought of it. Now my mind is only on winning the Olympic gold. Hope we get it.